John Rontree Baines was born in Stokesley in 1895, the son of Augustus John R Baines, blacksmith of Back Lane, Stokesley, and his wife Louisa Brignall. Augustus and Louisa were married in Stokesley in 1890, and raised their family in the town: Louisa, (born 1891), Edith Mary (1893), John Rontree himself, Frederick William (1898) and Emily (1901). Some older people in the town may still remember Augustus Baines, who lived until 1950, and never left the area. Augustus had a hardware business in the High Street, and it seems that the young John made a niche for himself there as a bicycle repairer. 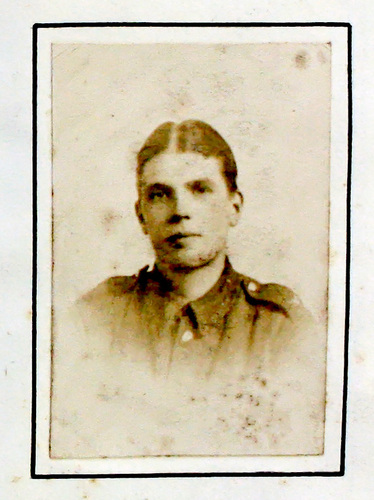 John Rontree Baines, whose middle name was derived from the surname of his maternal grandparents, enlisted as Private 2469 into the 4th Battalion of the Yorkshire Regiment at Northallerton in 1914, when he was 19. He was later transferred as Private 235095 to 10th Battalion, and was drafted to France as a Signaller with them in November 1916. This was at the end of the disastrous Somme Campaign, but Signaller Baines and his comrades-in-arms were still at the heart of the fighting. John Rontree Baines was 22 years old when he fell. He was awarded the British and Victory Medals and his body lies in plot D39 of the Cojeul British Cemetery at St Martin sur Cojeul, Pas de Calais. 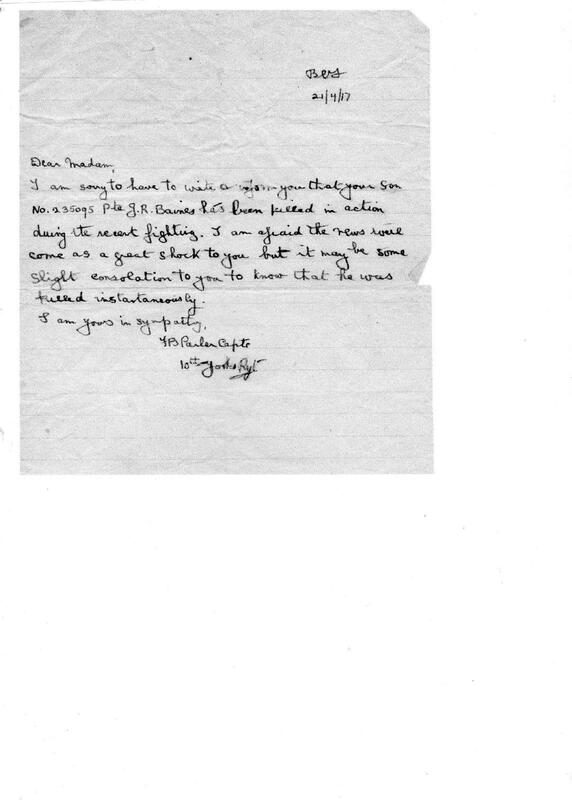 A photograph of a letter has been forwarded to us by Christine Bainbridge of the Stokesley Local History Study Group. The original was sent to John's parents after his death and is from his commanding officer. We reproduce it here with our sincere thanks to Christine and the Local History Study Group. Go to next soldier: Barker E.